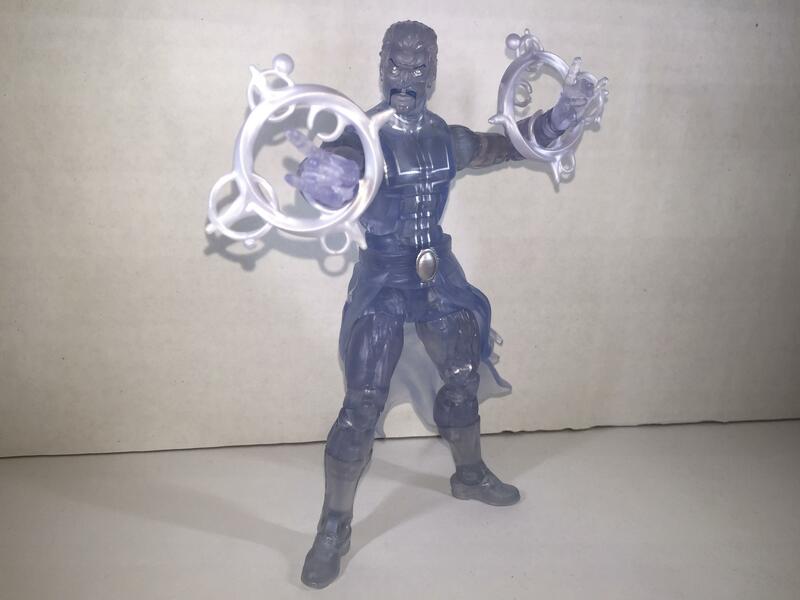 Toy Tuesdays – Marvel Legends Book of the Vishanti Astral Doctor Strange Review | Jesse Hecht C.R.E.A.T.I.V.E. Welcome, everyone, to Toy Tuesday! Today, we’ll be reviewing toys, action figures, LEGO, and whatever toy-related thing I can get my hands on! 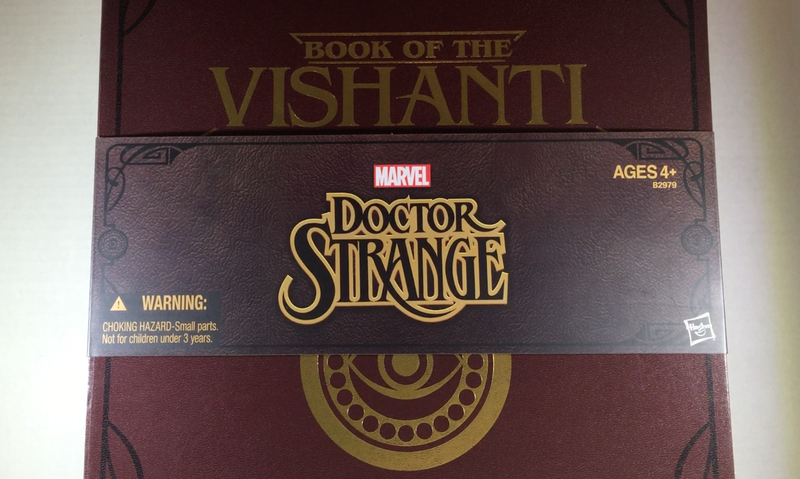 Today, we’re reviewing the Marvel Legends Book of the Vishanti Astral Doctor Strange figure from the San Diego Comic Con of 2015. 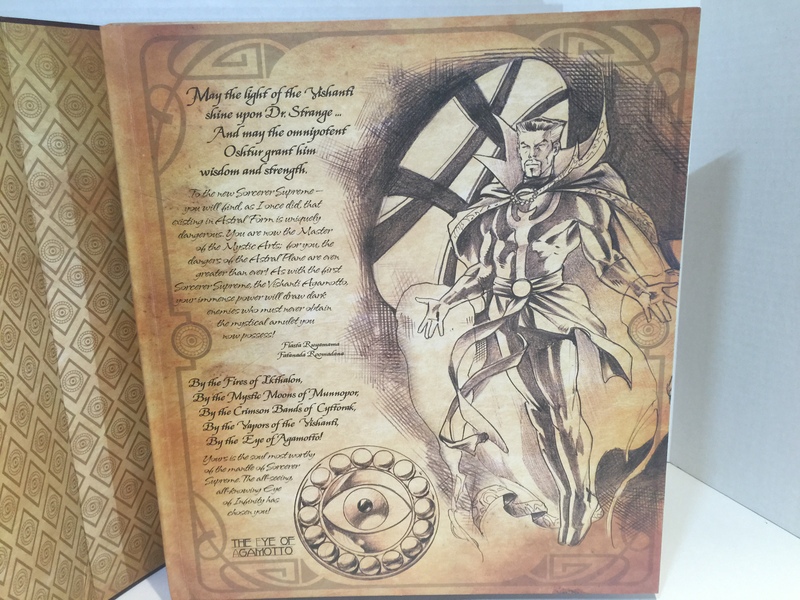 Astral Doctor Strange comes in a large box labeled “Marvel Legends Doctor Strange Book of the Vishanti” with four other figures, Brother Voodoo, Dormammu, Magik, and Hela. Let’s take a trip to the Astral Plane and visit the Astral form of Doctor Strange. 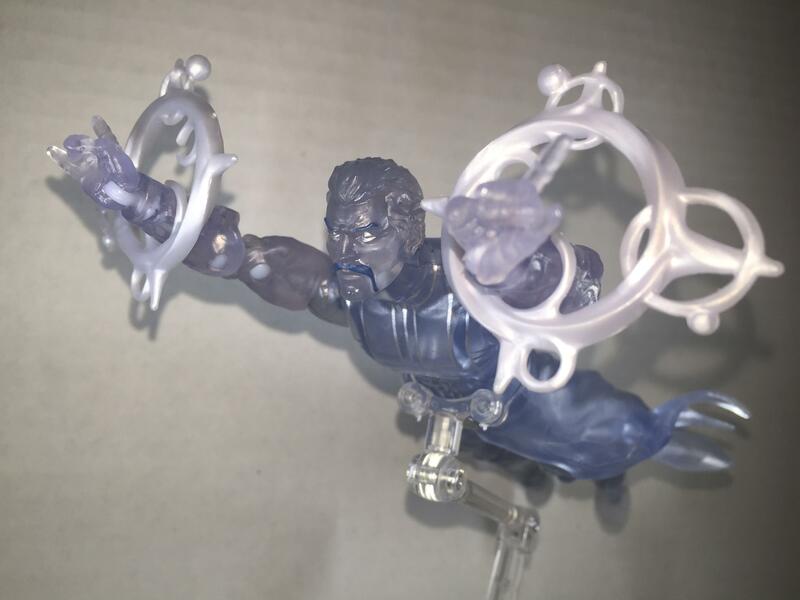 When I first started collecting Marvel figures, I narrowed it down to the formula of a hero, a mentor, and three villains related to that hero. I did not have a regular Doctor Strange figure before and I wanted to get a character that would act as a spirit guide to the hero. The mentors I picked when I started collecting would be characters that were special in some way and not regular figures. For example, instead of a normal superhero, I would get one that has different coloring. 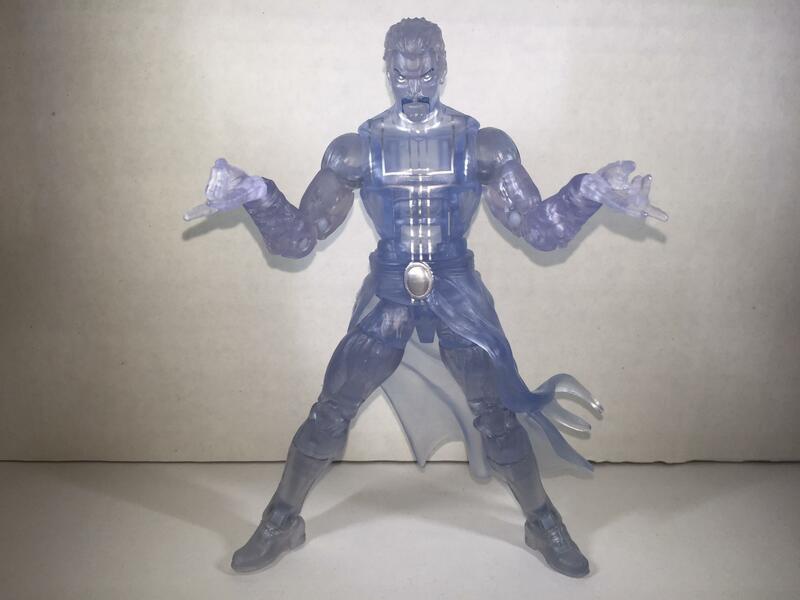 The two (now 3) comic versions of Doctor Strange’s figures consist of his more impressive transparent astral form, and the others his regular clothing, flesh-toned face and hands, along with magical effects (one with optional cape). When I recently watched the Ultimate Spiderman television series, (my gateway to the Marvel universe at large along with the Marvel Cinematic Universe (MCU from here on) films, Marvel Netflix series, and now Agents of S.H.I.E.L.D.) I noticed that the young Spider-Man often called to Doctor Strange for help (and even wore the Cloak of Levitation once). I really liked Doctor Strange when he appeared in Ultimate Spiderman, doubly so for the movie later on, and thought that the magic in the show was just what the MCU needed. I’m glad to say I was right (Doctor Strange Film review forthcoming after I see the movie for a third time). 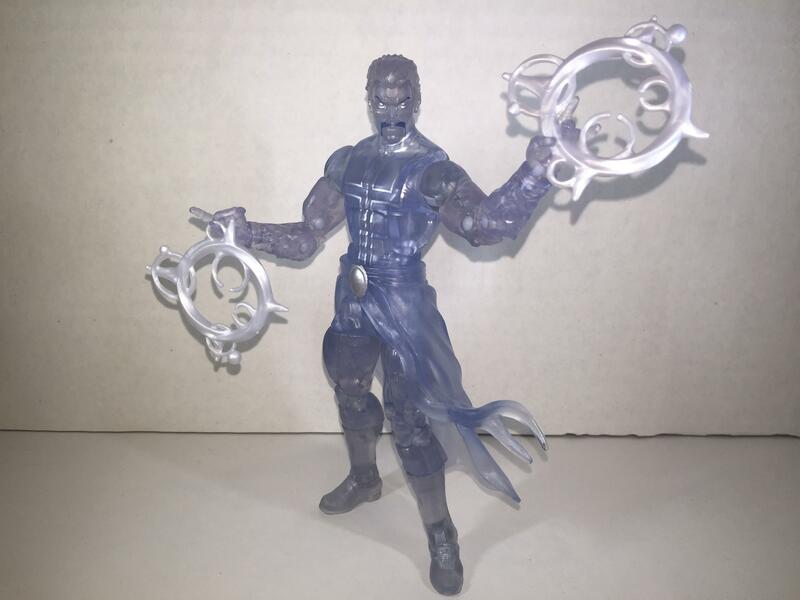 So I now have this Astral Doctor Strange figure to review. Let’s get reviewin’! The first thing that stands out to me is that Astral Doctor Strange looks like a ghost. 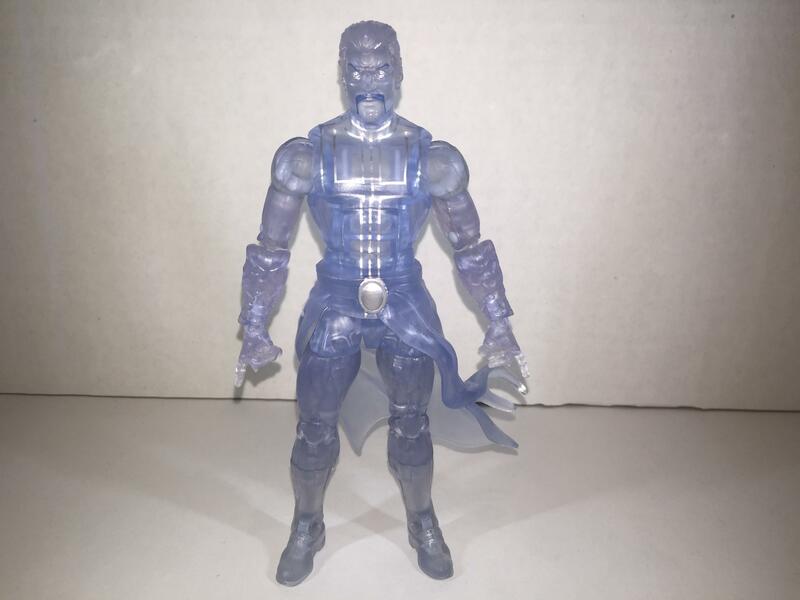 Sure, you can call him a Force Ghost from Star Wars, and yes, its fitting that Doctor Strange and Star Wars are owned by the same company, but Astral Doctor Strange has an ethereal quality that most figures, at least, in the Legends series, miss. 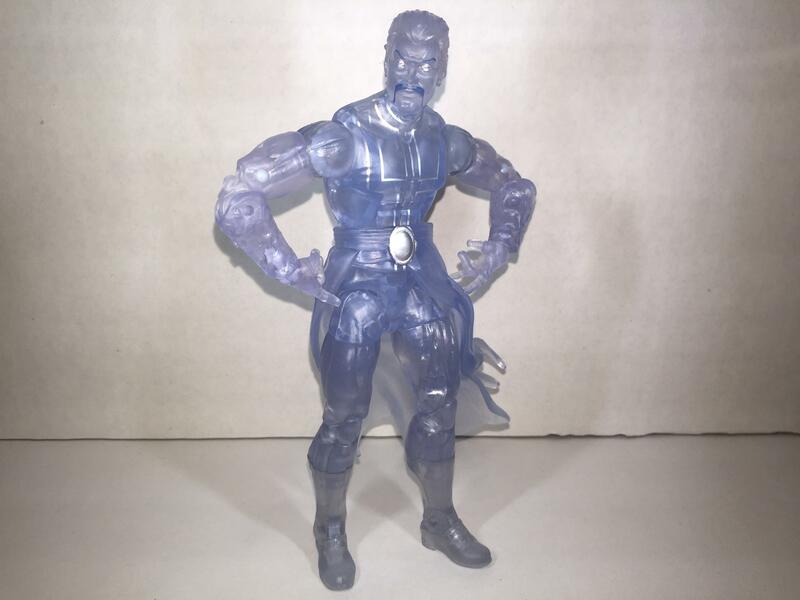 In an exclusive pack years ago there was a Marvel Legends figure, Ghost, (brilliantly voiced by Jim Cummings in a recent Avengers Assemble episode) that was a milky white hue. 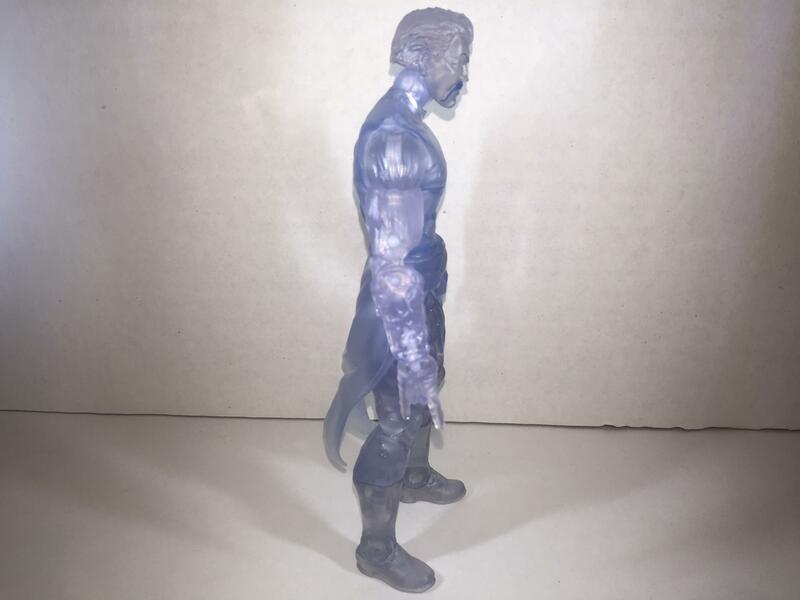 In a recent Marvel Legends X-Men wave, there was an Ice Man figure that, while not a ghost, was a solid blue, similar to this one. I’ll have to give Hasbro, the makers of this figure, a pat on the back for this. The blue paintwork is stunning. It’s reserved where it needs to be and goes all-out where it needs to be. The head and legs, which have the most sculpting texture, have the least amount of the blue paintwork, and this is what showcases the detail in the sculpt. The skirt piece gets a great color wash that showcases the creases and wrinkles of the fabric in the sculpt and I’m loving the synergy between sculptor and painter on this figure. Also to note is the silver paint. On the body it’s crisp and neat, even extending underneath the ab crunch for that extra bit of detail. On the eyes and the oval on his abdomen the paint bleeds out a little bit and it doesn’t really bother me as the eyes look symmetrical that way and I don’t really focus on the oval that much. 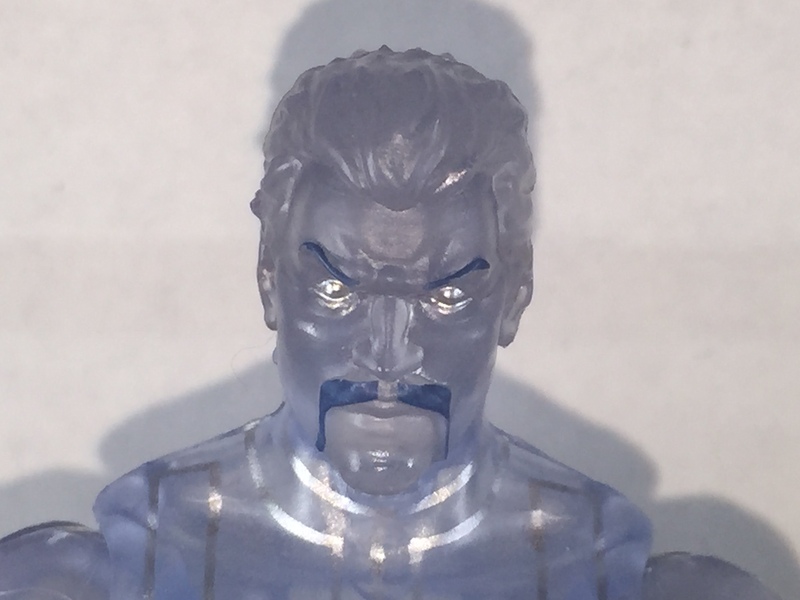 The mustache and eyebrows are painted with the appropriate amount of thickness and thinness where needed, and the mustache tapers off quite nicely. Like I said before, the lack of paint on the face really lets the sculpt shine. The sculpt, while shining, is nothing new to this figure, but as someone who has not seen another Doctor Strange figure in person, I think it looks really good. 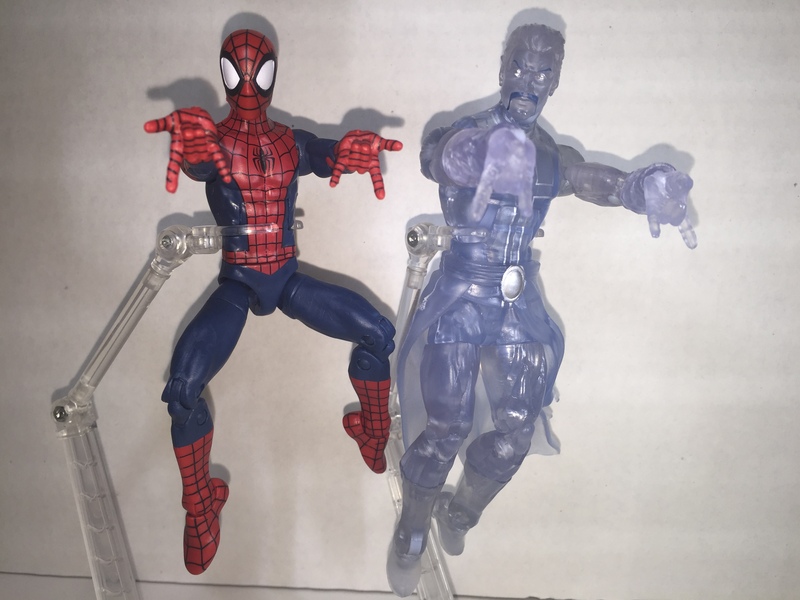 Not great, mind you, after all, to save costs, Hasbro reuses body part molds left and right. 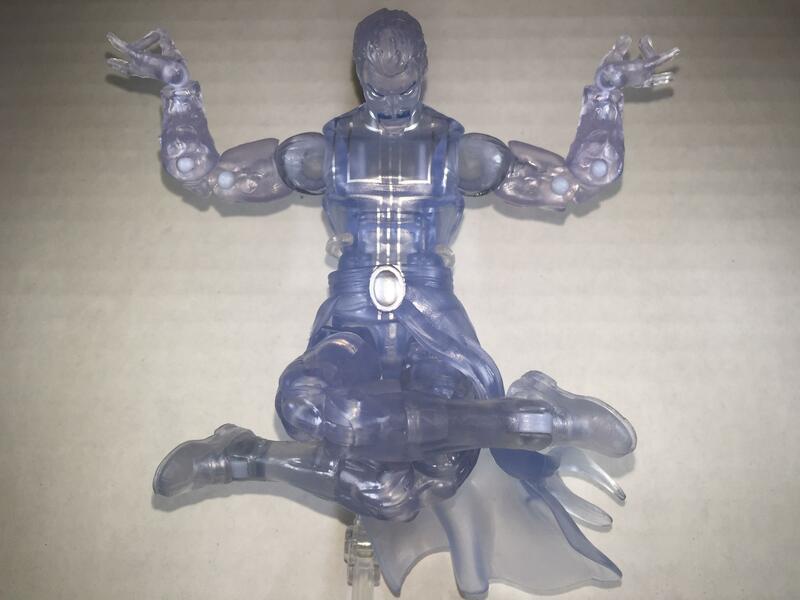 The legs and upper arms along with the lower torso were used first by the Marvel Legends Captain “Bucky Cap” America figure in 2012, and the Bucky Cap mold has been a mainstay of the Marvel Legends line to this day. 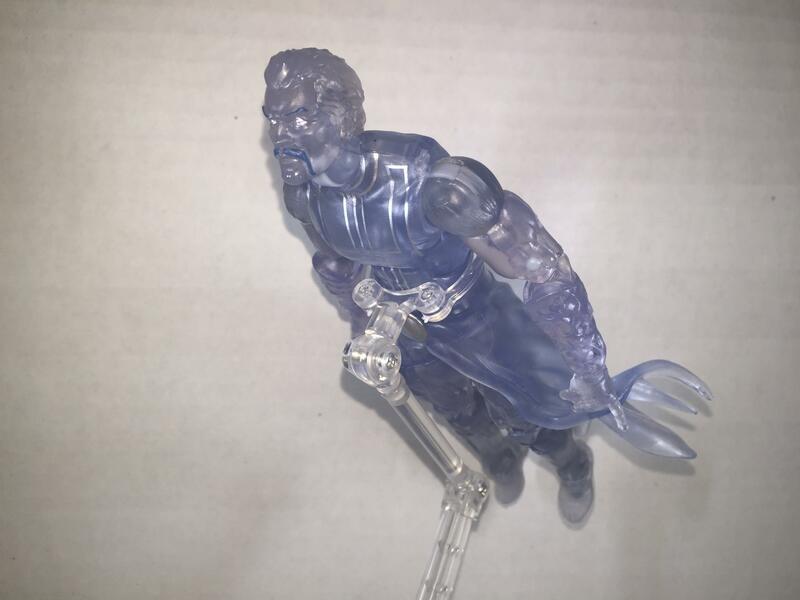 The forearms are not part of this mold type, and the chest mold was used before in a Doctor Strange figure within the same year, so it’s relatively new, which is a plus! 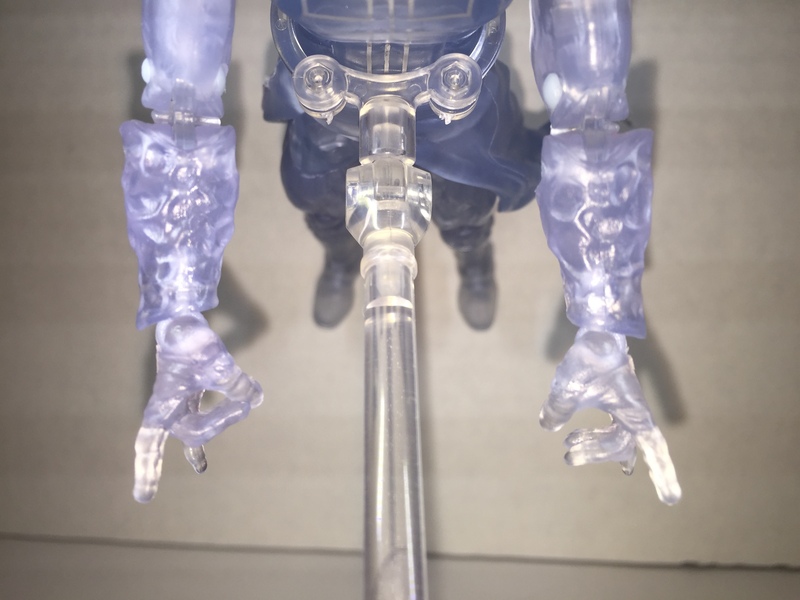 What’s good and not great about this body mold change is that it creates a valley between the gloves on his forearm and his upper arm. It’s like there’s a piece missing, and I know that the gap is there to be filled when he bends his arm but they could have found a way to make this more natural somehow. 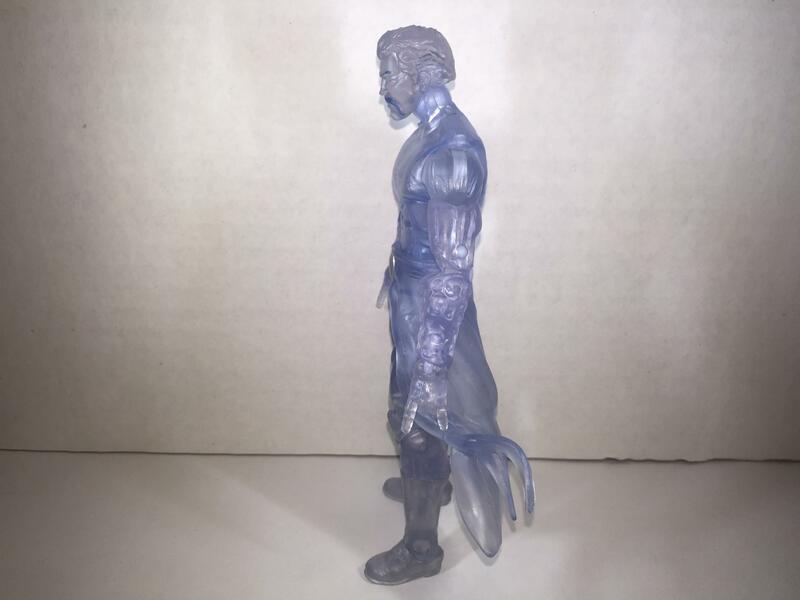 The legs and feet are all standard Bucky Cap leg mold, and they look just fine. You can interpret the wrinkles and creases on the figure as cloth wrinkles or the bulging creases of muscle definition. 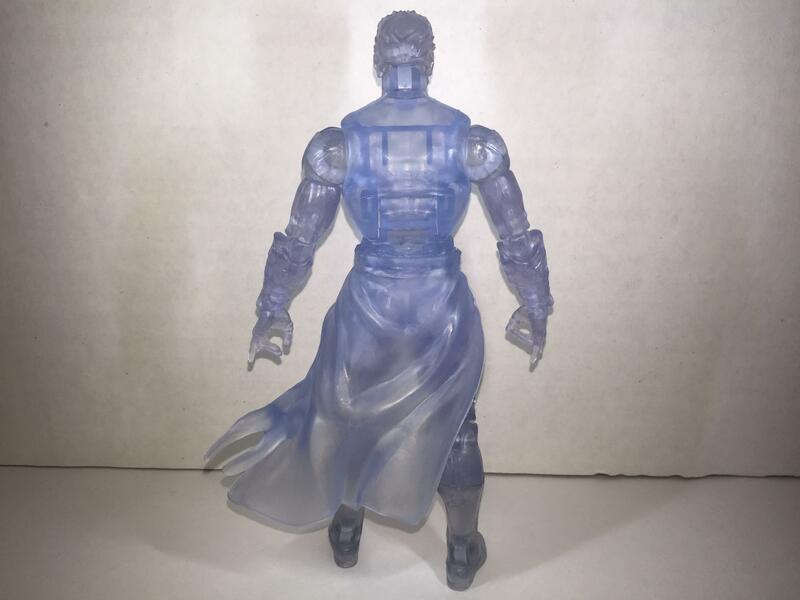 Either works, and I think that’s what Hasbro was going for: the fine line between cloth and muscle, and how to show off either/or while only using one mold. It’s genius, really, and economically sound. Back to the gloves, though (and Doctor Strange does wear gloves unlike most of the movie). These gloves appear to be dappled with what looked like holes, but on further inspection, they are the wrinkled heavy leather of worn gloves. 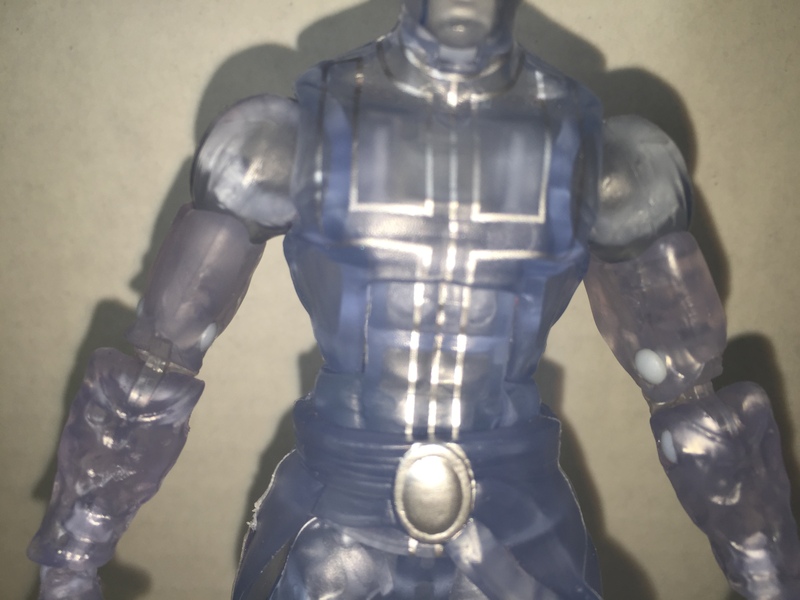 it’s a different texture than the clothing and the cloth around his waist, and I appreciate Hasbro showing this level of detail here. His hands are molded as signs for casting magic, or as some call it, the “rock on!” sign, or a sign for horns. The three closed fingers on the right hand are connected shut while the three closed fingers on the left are not. While Doctor Strange does not really use a weapon, it would be nice for both hands to be unconnected in case he needs to grab ahold of something while casting magic about. The magic that he casts comes in the form of two pearl-silver circles with with spikes, balls, and other circles on them, representing magic spells. It’s… Strange that they would be silver instead of a shade of, blue perhaps, and they look like giant shurikens (ninja stars) instead of magic spells being cast, but I think it suits him fine. It matches the silver on his body and eyes somewhat and gives credence to the silver color more so than the figure alone. 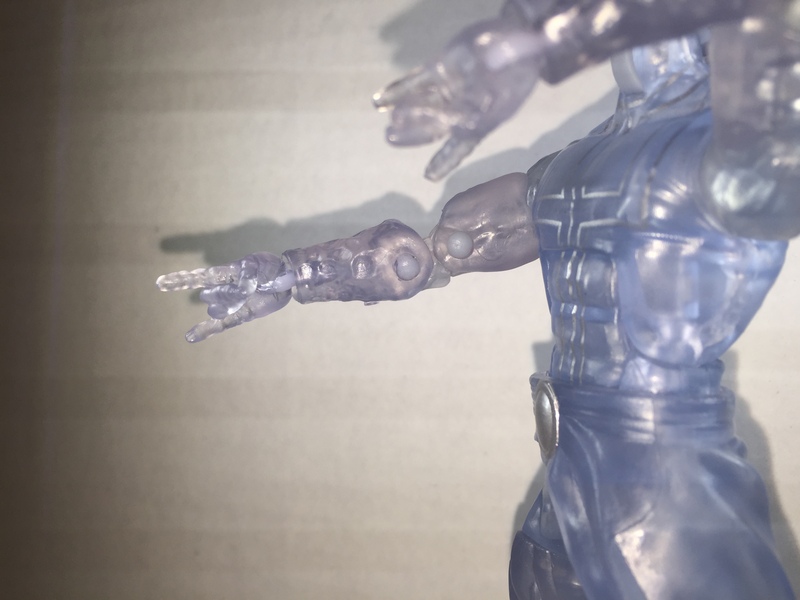 These magic effects can also clip onto the wrists of figures, but be warned, the hands cannot be taken off, so the wrist must be forced in, bending the clips slightly inward. Not a horrible detail, but one to at least look out for. His widest stance with both feet still flat on the floor is at 35 degrees. Impressive! Also, to note, the cloth wrapped around his waist can move slightly up and down and twist, which actually doesn’t affect the waist swivel but may cause paint rub. 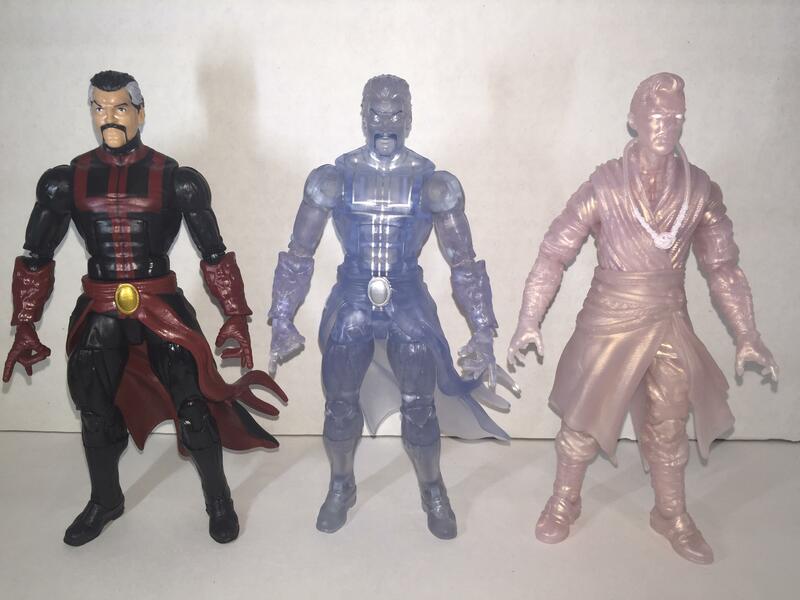 To compare this to other figures, here is Astral Doctor Strange next to the Dormammu BAF Series Movie Astral Doctor Strange and the Hulkbuster BAF (Build-A-Figure) Doctor Strange, as well as the Dormammu BAF Series. I personally think that the color is better on the Comic Astral Doctor Strange than the Movie Astral Doctor Strange. It gives the figure more definition and taste with its clear molding with light blue paint rather than being molded in a marbled pink and pearl-white hue. The Hulkbuster Doctor Strange figure is at least better with good colors and paint, but it is not my favorite Doctor Strange figure to date. Overall, this is a very good figure. Yes, it reuses oft-used body pieces, but the added gloves, head, chest, and skirt stand this figure above the rest that just use these body pieces. The real star is the paint application, which I think is spectacularly placed right where it needs to be.